The Tullen blunt cutters could cut anything, from flimsy cling-film to metal. Their versatility led to large export orders for Tullen Industries, especially after marketing manager Steve Bridges led a design team creating versions for the kitchen, the workshop and the playroom. 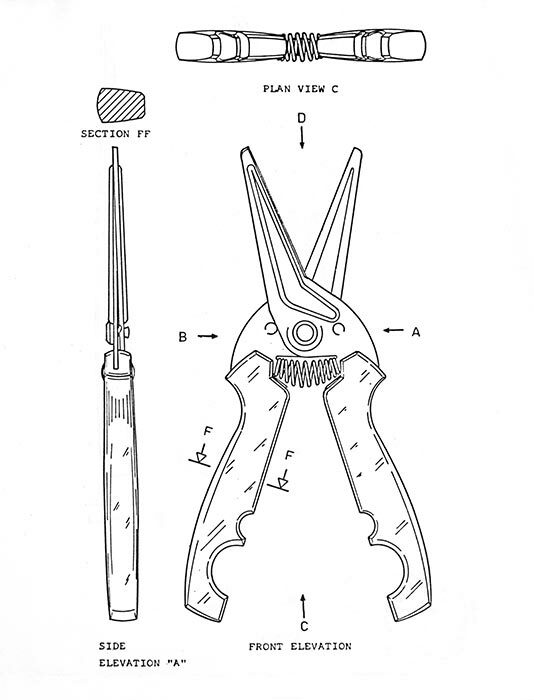 Pictured are patent drawings of the kitchen cutter designed by Peter Davies. In 1985 Tullen was sold to the British-based Wilkinson Sword, which sold its Home and Garden division to Finland-based Fiskars in 1988. When the new owners visited the almost-completed Auckland factory, they were not impressed by the latest innovation: the world’s most efficient robotic plant, designed to make 360 stainless-steel scissors per hour, 24 hours a day – far more than existing Fiskar factories. The scissor plant was scrapped and the blunt cutter production was shifted to a Wilkinson Sword plant in Wales.